Standing New Year’s Resolution No. 3: Go shoot some clay pigeons before the next upland bird hunting season rolls around. Alas, that resolution, along with those resolutions to go on a diet and become a better human being, is one that gets forgotten on January 2. 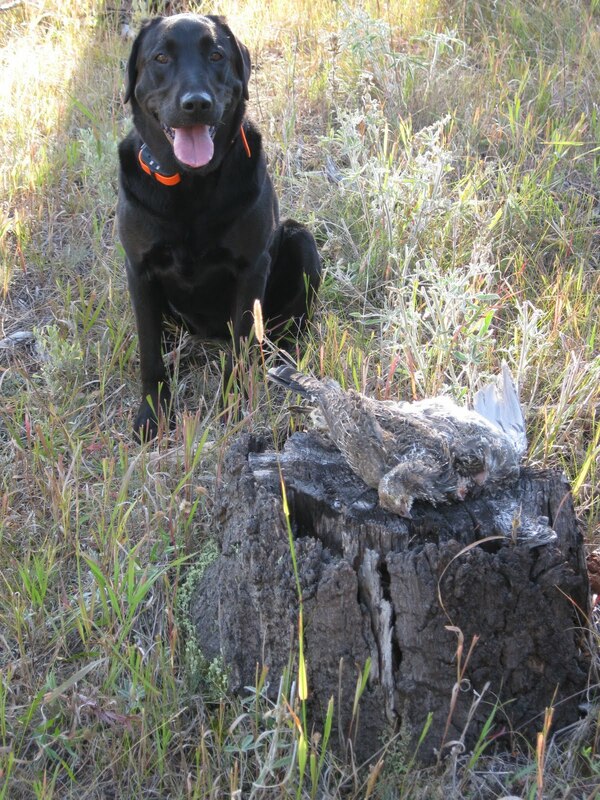 Then, when September rolls around and those first grouse flush, I’m reminded about that neglected resolution. The birds are in the air and instead of picking out a bird and focusing on it, I’m poking my shotgun in the general direction of the grouse and shooting. Shooting at flying grouse, or clay pigeons for that matter, is a lot like playing tennis. One of Butte’s tennis aficionados occasionally reiterates her Three Rules of Tennis. 1. Keep your eye on the ball. 2. Keep your eye on the ball. 3. Keep your eye on that danged ball! Ignoring those rules of tennis generally translates into taking an ineffective poke at the ball or what tennis commentators refer to as an “unforced error.” Baseball coaches give similar advice to both batters and fielders, and football coaches give that advice to pass receivers. Keep your eye on the ball. The same goes for shooting. Keep your eye on the bird. Fortunately, there’s nothing like missing some shots to reinforce the need to keep your eye on the bird. Things do get better. On those first walks for grouse at the beginning of the Labor Day weekend there was mostly frustration. First of all, on the mountain where Flicka, my Labrador retriever, were searching for blue grouse, there was evidently poor reproduction. Last year, hunting the same mountain, there were five separate areas where it seemed I could reliably find blue grouse. This year, just one of those spots, a long sagebrush ridge, had a covey of grouse. In any event, when Flicka finally had a chance to go on point, when the birds flushed I poked my gun in their general direction when I fired and, predictably, nothing fell. Later that day we took a walk up a brushy creek bottom in search of ruffed grouse. A grouse flushed and I had what should have been an easy straightaway shot. Again, I poked in the general direction and nothing fell. Flicka, bless her heart, went over in the optimistic hope that there would be something for her to retrieve, but her hopes were again dashed. A few minutes later four ruffed grouse flushed and I swung on the birds, but when I pulled the trigger nothing happened. I had neglected to flip the safety to the ‘fire’ position. That’s a pretty basic error in gun handling. The next morning we returned to that sagebrush ridge. Flicka, bless her heart, picked up the scent of the grouse and several grouse flushed from a brush patch. I missed what should have been an easy shot at the first bird to get up. I quickly reloaded and a couple more birds took off. This time I concentrated on the grouse and kept swinging on it, even after I missed the first shot. With the second shot from my over/under shotgun, the bird dropped. Flicka made the retrieve and I happily put the first bird of the season in the back of my vest. A few minutes later I had a shot at another grouse and dropped it with my first shot. The morning’s hunt ended with a vest pocket holding two blue grouse and a handful of fired shotgun hulls. It was one of those mornings where it felt like déjà vu all over again, as Yogi Berra once famously said. When I got into my first bunches of birds last year I did a lot of shooting before we actually put some birds in the freezer. I take comfort in knowing that things get better after getting those misses out of the system. That shotgun starts feeling like an old friend again and shooting at flying targets, whether feathers or clay, gets to be fun. Nevertheless, I did shoot some clay pigeons this week. Better late than never.